Yesterday, as Democrats began fleeing from the outrage of the American people over the President’s statement – since walked back – in support of the mosque at Ground Zero, House Speaker Nancy Pelosi surged forward with perhaps the most inflammatory statement yet on the subject. While Pelosi’s statement seems shocking in its political obtuseness, it’s also quite telling. The Speaker has told us two things we already largely knew about her. First, for Pelosi to recommend that the movement opposing the Ground Zero Mosque – a movement which encompasses some 68 percent of the American people, mind you – be investigated in an effort to find out who’s the money behind it is a window into her soul. 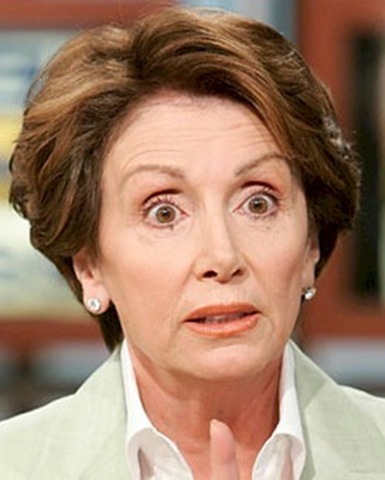 That Pelosi would think somehow that an opinion differing from hers is worthy of an investigation (she has since said she’s not talking about a Congressional investigation, but that’s clearly a crawfishing statement) is just short of dropping an F-bomb on two-thirds of the American people. She thinks you should be probed and prodded to find out who’s behind your opposition to the Muslims building a mosque on a site where the landing gear from Mohammed Atta’s hijacked jet crashed through the roof on 9/11. And she doesn’t quite care how insulted you might be at her stance. She hates you anyway. For a politician to make such a statement is indicative that she doesn’t see a downside within her district to such a stance, and also that her opinion of people outside her district who think very differently than she does couldn’t be lower. Which brings us to the second truth her statement shows us. The people Pelosi’s side needs to win elections don’t operate like the mainstream of America. While mainstream Americans can read an article in the newspaper or on the internet, or see a report on television, and analyze what they’re seeing in order to form their own opinions on it and act accordingly, the foot soldiers of the Left don’t work that way. The foot soldiers of the Left require community organizers or union bosses to apply “street money” or incitement to generate demonstrations. They need to be put on buses by SEIU or ACORN and given machine-printed signs and t-shirts to hold and wear. And they need talking points cooked up by the David Axelrods of the world. Pelosi has been swimming in this culture for decades, and so she expects that’s how political movements operate. This is why her first reaction to Tea Parties was “Astroturf” – as ludicrous and out-of-touch as that characterization was, it was little more than a projection of her experiences with left-wing politics and constituency groups and their inorganic nature. Study after study shows the vast majority of left-wing voters are grossly uninformed about history, economics and civics compared to conservatives and moderates – their involvement in political causes arises less from consideration of the issues and more from membership in identity groups. The Left likes to comfort itself by deriding conservatives, ironically enough, as sheep. The rise of the Tea Party movement has been difficult for them to explain. Which is why Pelosi and those like her are tying themselves in knots attempting to explain how conservative – or, in the case of the opposition to the Ground Zero Mosque, mainstream – causes can attract widespread support. In an interesting piece at Redstate.com today, Erick Erickson notes that the ruling class which includes Pelosi and the Washington-New York media axis constitutes a fringe element in American politics now. Roughly the same numbers of people believe that Barack Obama was born in Kenya, 9/11 was an inside job and support the building of the Ground Zero Mosque. The first two groups are widely denounced as fringe, and yet the third is just as small. But the fringe is in charge. Pelosi, as a manifestation of that fringe (the President is another), is operating as one would expect a fringe politician in charge to operate. She doesn’t belong in that position. It’s up to the American people to correct that error in November by voting her party out of power in punitive fashion. New York, NY, August, 14–For the last four months, 9/11 families, first responders, survivors and concerned citizens have been asking where developers are getting funding for a $100-million dollar mosque and Islamic center planned for Ground Zero. The imam who is heading the project has refused to identify the source of the $5 million cash that was used to purchase the building, and told an Arab newspaper that he will get funding for the project from Arab and Muslim countries. Given the imam’s statements, that America was “an accessory to the crime” on 9/11, that “Osama Bin Laden was made in the U.S.A.” as well as his repeated refusal to condemn Hamas, we believe he has an obligation to come clean to the public on his financial sources. Our concern has been amplified by news that the imam’s worldwide “Shariah Index Project” is being funded by the Malaysian government, and that he is a principal figure in the Perdana Global Peace Project, the number one funder of the Gaza Flotilla, a violent attempt to break the Israeli blockade of Gaza. Next Article Was Harry Reid’s Political Career Launched By A Pimp?